You can now print photos using Shutterfly, and create albums, books, posters, stationary, cards, calendars (do people still use those? ), and many more printed items that I didn't even know existed from your Picturelife account. I'll walk you through the steps, and offer a few suggestions along the way to make organizing and printing easy and fun. PLEASE NOTE: It's not possible to post an entire Album to Shutterfly - you'll need to select photos within the album (as many as you like) and then post to Shutterfly. EXISTING SHUTTERFLY ACCOUNT HOLDERS: If have an existing Shutterfly account, great, make sure you're actually signed in to Shutterfly (Shutterfly Sign In Page) and move on to step two. Click "Edit" next to Billing information - enter your CC info, click save, and return to Picturelife. If you get an error, return to https://picturelife.com/settings/networks and try again. To post one or more pictures to Shutterfly via All Pictures or an existing album"
close out of the POST TO menu and refresh the Picturelife browser page. Make sure the Shutterfly browser window is closed, and that there are no other Picturelife browser windows open. Confirm that the picture you want to send it highlighted in blue, and click the POST button. You'll see a banner notification confirming that the picture has been posted. 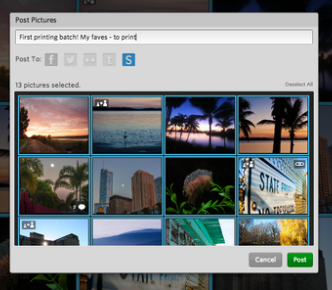 A new context menu will open - the pictures that you're sending to Shutterfly will be highlighted in blue. To un-select any of those photos, simply click the photo thumbnail from within that menu. To re-select a photo, do the same thing so that it's highlighted again in blue. Optional (but recommended) - Add a message to go with the post. This will be used as the album name in your Shutterfly albums. I named mine "First batch to print - fave photos"
9. You'll see a banner notification confirming that the picture has been posted. Once you've successfully posted pictures to Shutterfly and are ready to create and print, return to your Shutterfly account on the web. You'll see a message about Kodak Gallery, and it will look like you need to login again - disregard this. 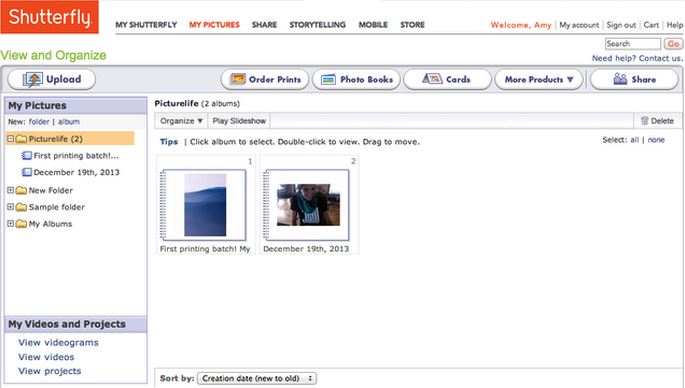 Under "My Pictures", you'll see an album created that houses the Picturelife photos you just posted to Shutterfly - click on the cover photo thumbnail to access those photos. You can see mine has an album called "First Printing Batch! ", which is the message I typed into the context menu when I posted the pictures to Shutterfly.